LionDesk is a real estate customer relationship management (CRM) platform that features lead nurturing and transaction management tools. The platform costs $25 to $49 per agent, per month and lets Realtors handle lead generation, management, and nurturing in one place. Get the most out of LionDesk by integrating with your lead generation tools, optimizing the built-in dialer and marketing campaigns, and more. LionDesk CRM organizes real estate leads in one place so you can access them from anywhere. The software keeps track of lead contact information and tracks emails each contact has opened, previous calls or texts, and relevant data. LionDesk also assigns leads to specific agents so that valuable prospects don’t fall through the cracks. Beyond LionDesk CRM capabilities, the platform serves as an email marketing tool for lead nurturing. Agents can also use email marketing templates, sample scripts, and autoresponders to follow up with prospects efficiently. Plus, once you convert a lead, the software integrates with Dotloop, a transaction management platform, to help you stay on track of deals. Unlike more general CRMs like Freshsales, LionDesk is a real estate-specific CRM with features like property management workflows and prebuilt plans like closing, listing presentations, and 30/45 day escrow plans. These Realtor-specific tools and its integration with internet data exchange (IDX) websites and round-robin lead assignment can be optimized in a few steps to help you get the most out of the LionDesk platform. LionDesk is right for solo agents, small to medium teams, and large brokerages that want to manage and nurture leads in one place better. The platform offers an extremely robust and user-friendly CRM, lead nurturing tools, and transaction tracking features that make it an excellent choice for a wide range of real estate professionals. Choose a package based on the number of emails you plan to send and whether you want to send video texts. LionDesk offers two packages to fit the needs of solo agents and small to medium teams. At $25 per user, per month, the Pro package is best for agents who don’t need to send many texts or emails and don’t want video texting. Pro Plus is $49 per user, per month and features advanced tools like video texting and higher messaging volumes. The Pro package costs agents $25 per month and includes 100 outbound texts and 5,000 outbound emails per month but does not include the video texting included in the Pro Plus option. This is a great option for solo agents who don’t plan on sending a large volume of texts and emails each month and who don’t want the added benefits of video texting. For $49 per month, agents can send 2,000 outbound texts per month and 20,000 outbound emails per month. Plus, your team can send 100 video texts and will benefit from increased document storage and advanced call features like call tracking and custom local area code phone numbers. Choose this package if you have a team of agents or brokerage and anticipate using the platform primarily to send out bulk text and email campaigns. LionDesk offers custom pricing for large teams. However, we didn’t evaluate this option because Pro and Pro Plus are suitable for most small businesses. Contact LionDesk directly for more information on an Enterprise plan that will work for your large network of agents. LionDesk also offers the Power Dialer as an add-on to the standard packages. This feature is an additional $49 to $59 per month and enables agents to integrate their contacts with their cellphone. The Power Dialer automatically calls leads, allows you to take call notes and tracks communications within the CRM user dashboard. In addition to offering paid packages to fit the needs of solo agents and teams alike, LionDesk offers a free 30-day trial. However, if your team does not require real estate specific planning tools, Freshsales can provide highly customizable basic lead management for free, with no time limit. You can learn more about Freshsales and take advantage of its forever free Sprout plan by signing up on their website. LionDesk boasts a variety of Realtor-specific tools that can be optimized to organize, nurture, and convert your leads. Once you use LionDesk to maximize lead generation, assign prospects easily to specific agents, track communications, and more. Plus, LionDesk helps you make a maximum impact with easy to use video email and text campaigns. At its core, LionDesk offers a robust and user-friendly real estate CRM for managing leads. LionDesk users can get the most out of the CRM by uploading their existing contacts from a .CSV file and integrating with lead generation tools like Real Geeks. The platform also makes it easy to parse data from emails using the Parseur integration through Zapier. To import existing contacts, select “Welcome, (your name)” in the top right-hand side of your account, and then click on “Profile.” Then, select “Import New Contacts,” and choose a .CSV file. 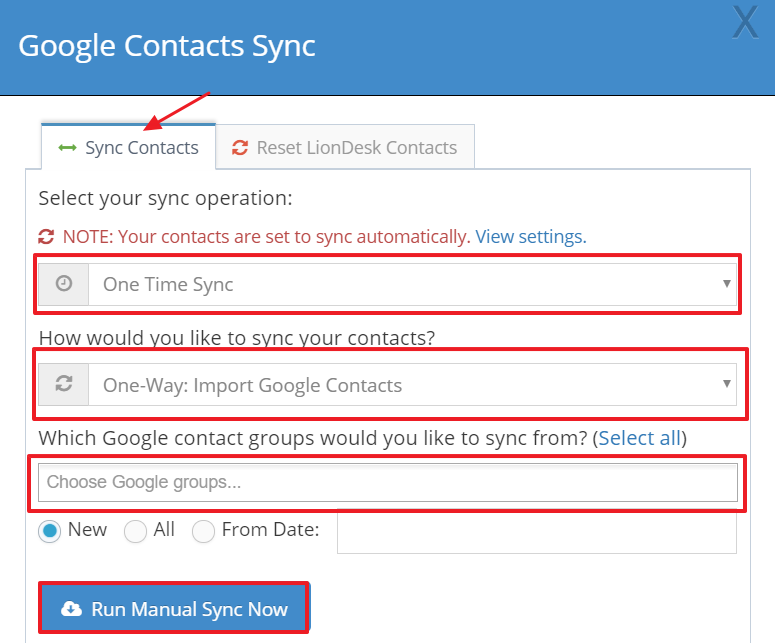 You can also sync with your Google contacts by linking your LionDesk with your Google account, choosing “Sync Google Contacts,” and then selecting your preferred sync frequency. Screenshot of Google Contacts sync in LionDesk. The primary way to integrate your existing lead gen tools with LionDesk is with an application programming interface (API) key. To do so, select the “3rd Party Integrations” tab in Settings and enable the appropriate lead source providers like Real Geeks. Then, copy the key, and paste it into your lead source provider’s website. You can also use Zapier to route leads from sources like Facebook straight to LionDesk. 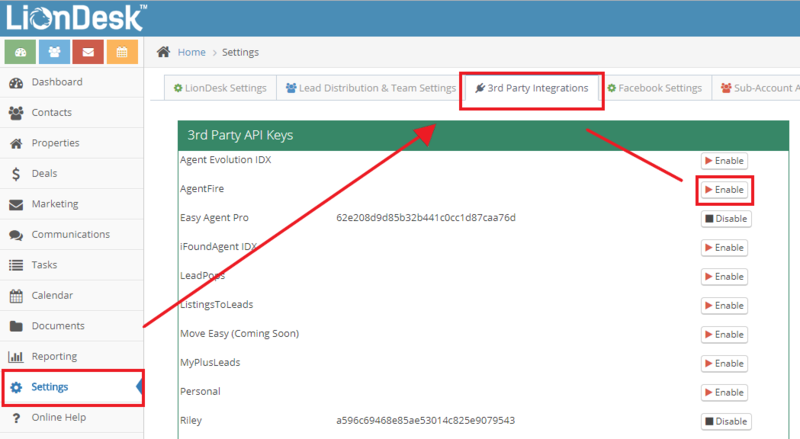 Screenshot of LionDesk 3rd Party API Keys integration page. LionDesk lets you set up your contact list in a way that helps you and your agent track and nurture the most valuable leads. Depending on the information you collect from each lead, you may organize your contacts table based on first name, last name, spouse name, birthday, lead hotness, and more. Just customize table contents to include appropriate information and filter as necessary. 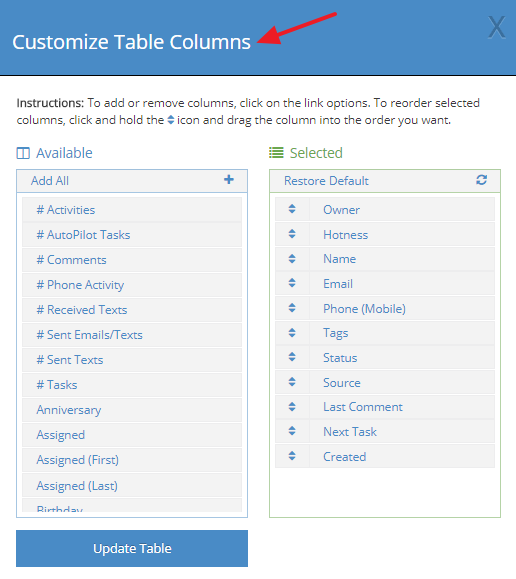 Screenshot of table customization in LionDesk. LionDesk CRM features a lead assignment tool that lets you choose how incoming leads are assigned to members of your team. With this feature, you don’t have to waste time assigning leads to your agents manually, and you can always ensure that agents are following up with prospects in a timely manner. LionDesk continues to track the lead and re-assign it to another agent if the prospect doesn’t receive a follow-up communication within a certain period of time. The LionDesk platform lets you assign leads in one of two major ways: round-robin or time-based rollout. First, choose how you want leads to be distributed under the “Lead Distribution & Team Settings” tab of general settings. Then, choose how each of your agents will be notified of the new lead via call, email, or text and dictate how agents can claim leads. Screenshot of LionDesk round-robin lead assignment. Video is a powerful way to capture and keep the attention of potential clients by sharing valuable content like educational materials or listing details. LionDesk CRM lets agent record personalized videos directly from the platform and send them to contacts via text or email. This feature is only available in the Pro Plus package, but it is well worth the price if you have room in our budget. For example, if you receive an inquiry from a potential home buyer, you can use the software to create a personalized video message for the lead. Record a quick video — “I received your request regarding the property on Lance Road! My name is John Smith, and I’d be happy to schedule a showing at your convenience.” — and send it out without ever leaving the LionDesk platform. If you need some inspiration, check out our list of real estate video examples. Screenshot of how to create a video text in LionDesk. LionDesk features Blended Campaigns that let you and your team send strategic combinations of texts, emails, and video to your leads. In addition to catching the eye of leads with interesting and varied marketing content, you can use LionDesk to schedule different types of marketing materials for different days and times based on each contact. To take advantage of this feature, choose “Auto Pilot Drip Campaigns” under the Marketing tab and add a new task to drip. LionDesk lets you choose from text, email, calling, or direct mail; if you select email or text, LionDesk will automatically provide a variety of templates. Then, you can decide whether you want your message to be sent immediately, days later, or on a specific date. Create a recurring task if you want a lead to receive the same communication repeatedly. 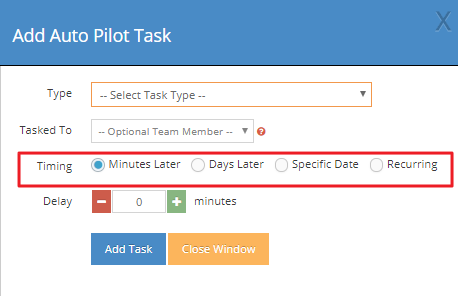 Screenshot of Auto Pilot Task feature in LionDesk. 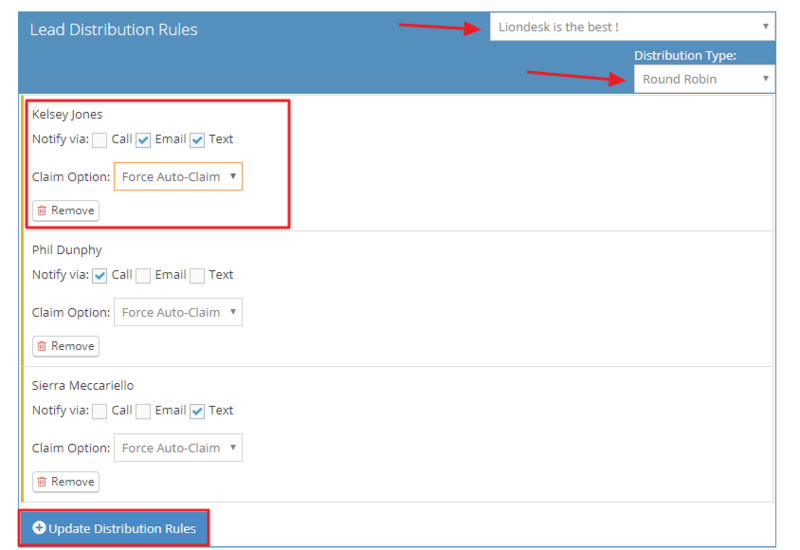 Unlike CRMs that require integration with a third party dialer, LionDesk CRM has an optional built-in dialer. The LionDesk Power Dialer makes it easy to contact leads directly through the platform, streamlining follow-up tracking by automatically updating contact records in real time. The dialer costs an additional $49 to $59 per month, depending on your package. To use the LionDesk Power Dialer, sign up for the additional service and access it from the “Contacts” portion of the agent dashboard. Select the contacts you want to call, and then hit the Power Dialer button at the top of the page. The dialer will call your cellphone, and you can move through contacts using the “Start Next Call” button. Screenshot of LionDesk Power Dialer. 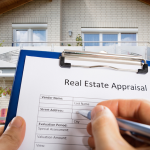 LionDesk CRM can also help build your reputation and client relationships by keeping you organized throughout your real estate transactions. First, the platform provides preloaded transaction plans that help you monitor each stage of the closing process from deposits to home inspections and financing. You can also use LionDesk’s integration with Dotloop for editing, sharing, e-signing, and storing closing documents. Screenshot of LionDesk Property Plan Tasks. 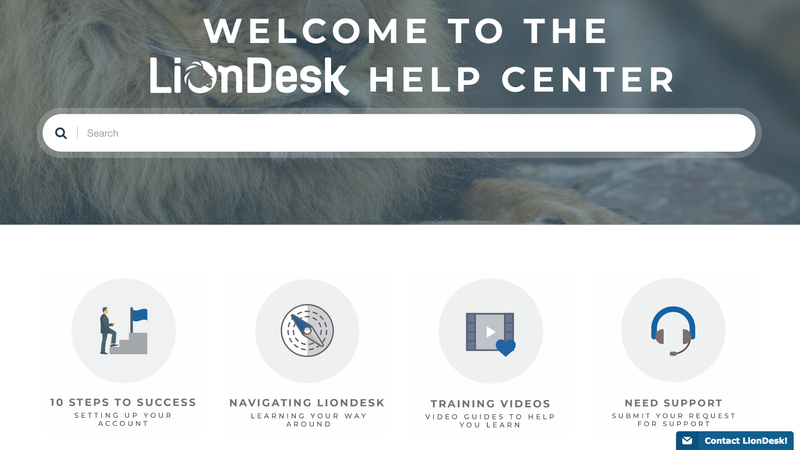 LionDesk support is available through the LionDesk Help Center, which provides agents with extensive resources including step-by-step instructions for using the platform. The Help Center also includes easy-to-follow video tutorials to guide you through each element of the CRM, drip campaigns, dialer, and more. Simply use the search bar to identify the appropriate topic and browse through relevant resources. If you can’t find the answers you need using the Help Center, LionDesk support is available through a contact form on the Help Desk website and via phone and email. You can also use the LionDesk live chat option when representatives are available or request an appointment with a Support Hero to address your questions directly. Screenshot of LionDesk support options. 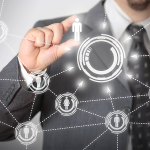 Agents who use LionDesk CRM find that the platform is both robust and user-friendly. In addition to offering a variety of standard features like contact management and basic email marketing, the CRM empowers agents to increase conversions with advanced tools like extensive automation, a built-in dialer, video texts, and more. Users report that LionDesk CRM enables them to efficiently follow-up with leads at a great value, but some agents find the platform to be clunky and cumbersome. In addition, several agents have indicated that the platform’s integration with Google is incomplete and difficult to use. Despite these concerns, LionDesk support team appears to be extremely responsive and dedicated to improving shortcomings within the software. If you’re concerned about LionDesk’s pricing structure or want a more streamlined CRM, consider an alternative like Freshsales. An alternative option may also be appropriate for agents who prefer to have a general CRM rather than a real estate-specific platform. Check out these alternatives for a range of pricing packages and features. LionDesk CRM is an ideal option for many agents but may still be beyond your budget or more advanced than you need as a solo agent. Freshsales is a great alternative because they offer a wide range of packages, starting at the Forever Free version and going up to $79 per user, per month. Plus, Freshsales offers a free 30-day trial, so you can try it risk-free if you want to venture into CRMs without breaking the bank. Pipedrive is a general-purpose, cloud-based CRM software that simplifies the sales process and helps sales teams manage relationship building and nurturing. The platform is highly intuitive and user-friendly and can help agents manage their transactions using the pipeline management tool. Pipedrive starts at just $15 per user, per month, so it’s an affordable option for agents who want a general CRM. Zoho is a general CRM software that helps small businesses manage their contacts and automate their email marketing and lead generation tasks. The cost of the platform ranges from free for three users to $20 per user, per month, making it an excellent option for solo agents and small teams. Users find that the platform is comprehensive, customizable, and an excellent value. LionDesk is a CRM platform for real estate professionals. The software includes standard CRM features plus lead nurturing tools, a built-in dialer, email marketing, and transaction management tools. LionDesk is a great option for solo agents or small teams who want a fully featured CRM that helps you automate lead assignment and follow-up for a low monthly price. What Does CRM Mean in Real Estate? In real estate and other fields, CRM means “customer relationship management.” A real estate CRM helps agents import all of the leads they generate through different platforms and organize them in one place. Standard CRM platforms include features like lead assignment, follow-up tracking, and integrated or built-in email marketing, dialers, and more. Is There a LionDesk App? The LionDesk app is available on iOS and Android devices to help agents track leads on the go. The app lets you manage and modify contacts, assign leads, and create drip campaigns. Plus, it tells you when you receive a call from a lead already in the CRM so that relevant data is at your fingertips. LionDesk is a CRM that helps agents organize and nurture leads and manage real estate transactions. The platform costs $25 to $49 per agent, per month with an optional Power Dialer for $49 to $59 per month. While LionDesk offers a good value for real estate, it’s Power Dialer add-on may make it a less affordable option than a customizable, general use CRM like Freshsales. Freshsales may not have the built-in property planning tools found in LionDesk; however, it is one of the best CRMs for small business. Includes a built-in dialer and can be customized to fit the needs of your agency with new integrations coming every day. This makes a terrific alternative option and one you can try for free by signing up for its forever free Sprout plan or test driving one of its more robust paid plans for free for 30 days.